As the son of a Tennessee trial lawyer, Mr. Hamilton gained an appreciation of trial advocacy at an early age which serves him well today. His regular clients include the largest nongovernmental healthcare system in Alabama; various product manufacturers, including the world’s third-largest producer of agricultural equipment; national trucking companies; and one of the largest industrial contractors in Alabama. September 2016: Obtained $800,001 jury verdict for Mobile, Alabama clothing design company in commercial litigation case following one week trial. Castles and Crowns, Inc. v. Brandi Stuart et al., in the Circuit Court of Mobile County, Alabama (Case No. CV-2011-900883). September 2015: Obtained $901,000 jury verdict for Mobile, Alabama hospital in product liability/indemnity case following two week trial. Mobile Infirmary Association d/b/a Mobile Infirmary Medical Center v. Sizewise Rentals, LLC, et al., in the Circuit Court of Mobile County, Alabama (Case No. CV-2012-901890). November 2012: Obtained Judgment as a Matter of Law at Close of Plaintiff’s Case in favor of industrial contractor following three days of testimony before a jury in a wrongful termination-retaliatory discharge case. Wiggins v. G.A. 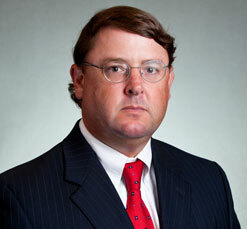 West & Co., Inc., in the Circuit Court of Mobile County, Alabama (Case No. CV-2011-901483). September 2011: Obtained defense jury verdict in favor of trucking company in case involving claims of permanent injury. White v. System Transport, Inc.,in the Circuit Court of Escambia County, Florida (Case No. 2009-CA0983J). June 2011: Obtained Post-Verdict Judgment as a Matter of Law for Korean seatbelt manufacturer following two-week jury trial in complex product liability case. Leytham v. Kia, Celltrion DBI, et al., in the Circuit Court of Mobile County, Alabama (Case No. CV-06-2263). Mr. Hamilton and his wife, Abbie, who also worked as a civil defense lawyer before becoming a full-time mom, are parents to five children: Kaitlyn, Libbie, Emma Jane, Joe and TC. A top-ranked junior tennis player in high school, he still enjoys participating in tennis and golf tournaments in his free time.